This article contains information and puzzle solutions for the puzzles in Uncharted: The Lost Legacy. Uncharted: The Lost Legacy has various puzzles. And with these puzzles, there are also puzzle solutions. Some of the puzzles may drive players crazy. These puzzles range from jumping puzzles, dial-based puzzles, and others. Actually, this is majority of the meat for Uncharted: The Lost Legacy. But not to worry! Here’s a guide for all the puzzles in Uncharted: The Lost Legacy. This puzzle isn’t really part of the story but it does unlock the Serpent Hoysala Token. Head north from the Pig Hoysala Token Location before making your way to a large building. There, you’ll spot a bell. Climb up the building and shoot the bell near the locked door. Shoot all the other bells then it’ll lead you to the Serpent Hoysala Token. Move Forward. Then, make a Left. Then, keep walking forward until complete. In summary: Start, Forward, Forward, Right, Forward, Left, Back, Forward, Left, Forward, Forward. Start by heading Forward. Then, turn right. After turning right, make a left. Head Forward before turning left again. Then, head Forward but turn right. After that, head forward twice to complete. In summary: Start, Forward, Right, Left, Forward, Left, Forward, Left, Forward, Right, Forward, Forward. Move forward again before making a right. Turn left and then right. Make another right and then, move forward. Once there, turn right again and then move forward. Turn right once more and head forward again. Make a left and then right. Turn left twice before finally going forward twice. In summary: Start, Forward, Forward, Right, Left, Right, Right, Forward, Right, Forward, Right, Forward, Left, Right, Left, Left, Forward, Forward. Wheel 1: Head out to the entrance and you’ll find it lying on the ground. Wheel 2: Head back to the locked door before moving along its left side. There, you should spot a water stream. Once there, you’ll find a wooden structure that has the wheel. Wheel 3: Look for a waterfall at the right side of the locked door. There’s a stone monument nearby which has the wheel. Wheel 4: From wheel 3, climb up the rocks on the nearby waterfall. There, keep walking right. Continue walking until you reach the end. There, you just have to climb to find the final wheel. After finding all the wheels, head back to the locked gate. The door will open and reveal the last puzzle. All the player needs to do is to create an image of a Trident. Second Statue – Swing right on ahead and rotate it to have it face Shiva. Third Statue – This doesn’t necessarily have to face Shiva. However, the light beam must be complete for the player to proceed. Fourth Statue – This statue is broken but Nadine will hold up the mirror for you. Fifth (Final Statue) – Swing ahead before Nadine points the last mirror and drag the final statue. Adjust Ganesha’s arm in accordance to the third picture. 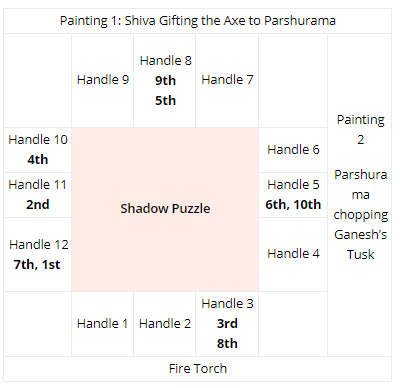 Then, fix Ganesha’s arm to follow the second portrait.